To Crease or not to Crease? I used to never crease my chinos. It seemed too fussy. Not that it looked overly fussy, but rather that it said to others that I spend an excessive amount of time thinking about and prepping clothing which is exactly the opposite reason that I am attracted to a classic American style. However, in pursuit of the perfect pair of chinos I began experimenting with the crease…and liked it. Far and away the biggest reason that I liked the crease is the tapered silhouette that it creates. This makes perfect sense when I started to think about it. Ironing pants without a crease actually increases the amount of chino visible from the front presenting the viewer with the widest possible leg. By ironing a crease down the middle of the pants the amount of visible chino is reduced and instead of a flattened chino the viewer is presented with the edge of a diamond shape. The tradeoff is that profile of a creased chino is wider which is more than a fair exchange in my book. For comparison, here is a picture of the same pair of chinos featured above, but without a crease. There is another reason that I am growing fond of the crease and that reason is formality. A crisp pair of chinos ironed with a knife blade crease is better suited for a blazer than those without. The crease takes the chinos from casual to business casual (see blazer picture above). This can be a double edged sword as it can make a casual rig look off. When wearing a pair of chinos on the weekend I would avoid a knife blade crease (or any crease). I now tend to crease more chinos than not. It helps to create the tapered silhouette that I have been in search of without having to go through round after round of alteration. It also communicates a more professional image especially when worn with a blazer or sport coat. I am still learning when to crease and when not to crease, but the biggest lesson that I learned is that I need to be flexible and not live by absolutes. 17 Comments on "To Crease or not to Crease?" It’s good to have the option, makes your chinos more versatile depending on the scenario. Now the next question has to be ‘cuff or no cuff’. Billax – Thanks for the kind words. “Dramatically” is definitely how I would (or should have) described the impact that a crease has. 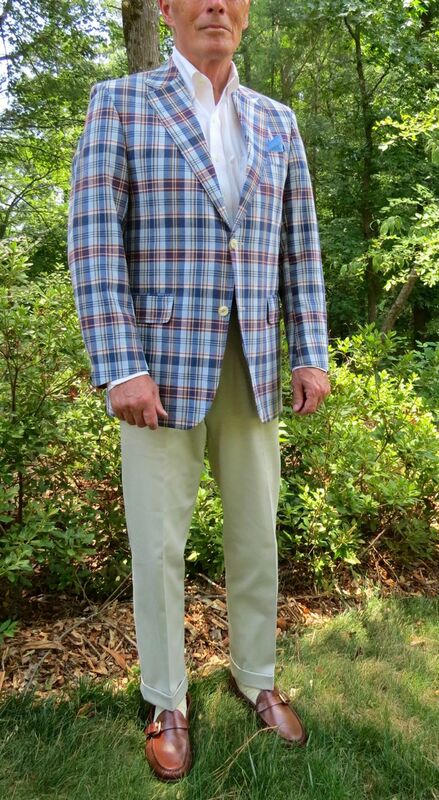 Great looking madras sport coat! I’ve felt this way for a long time. I’d even argue that the type of blazer, shoe and shirt can almost demand a creased or un-creased pair of chinos. For example, a formal blue blazer (traditionally tailored, gold buttons, etc.) almost demands a pair of creased chinos or the contrast of dressy to casual is too great. Conversely, a casually (or soft) construction sport coat (buttons muted color matching or close to fabric color) all but asks for uncreased chinos. The same logic applies to a pinpoint oxford shirt, silk tie and wingtips – they all call out for a crease. Where as Chukkas and an open collar and bit-worn OCBD say no crease. Texture also plays a role as the more refined fabrics ask for creases. The end result (as you reference) is that the outfit in its entirety should feel harmonious with no articles standing out as meaningfully more or less formal than the others. Oxxy good. I hang chinos and jeans on line wet folded on the crease. That is they dry with a bit of a crease. Then I fold them over and stack in crease position. Usually I then wear without ironing. It gives them a relaxed sort of ironed look, with a relaxed crease but definetly as if there was a crease. Not as crisp as ironed but neither is it rumpled and wide across. I do much the same with most ocdbs. I’m also becoming increasing fond of the crease, however more on the technical side I can’t get a crease to hold for long on cotton trousers. Whether I send my chinos out to a professional laundry or iron them myself the crease is almost gone by the end of the day. I’ve trying starching and using a tailor’s clapper (see Google if don’t know what this is). MHJ – My creases lose their edge as the day goes on. I expect that. For instance, the picture with the blazer was taken first thing in the morning, but the madras pic in the late afternoon. I use Magic Sizing which is like a light starch. This brings up a concern that I did not mention in this post and that is creating a visible line down the front of my chinos from ironing. I am not sure how long it will take for this type of wear to show. FXH – That is an interesting method that you describe. I may have to give it a go. Fading Fast – You make some great points. Thanks for contributing! My method is to iron in a crease after every wash, put on hanger or hem clamp hanger between wears. The closer they get to the next wash, the more relaxed the ensemble (blazer to madras sportcoat). I avoid ironing after every wear because the steam and heat from the iron can set in dirt. Your blog is rad BTW, the tone is really pleasant and your articles well thought out. Thanks OCBD, I guess I had unrealistic expectations. Saves all the aggro of ironing trousers, 20 mins in the press while you’re getting yourself ready and they come out with a lovely crease. The sleeves on all your shirts are too long! I can’t stand it when sleeves aren’t at the correct length and drape over my hands, looks sloppy too. OCBD, I was in the military for 28 years (education officer). Always have and always will crease my trousers. Sharp look, maybe I should start crease my chinos.. btw where is that chinos from? Brazil – Thanks, The chinos are J.Crew Essential in Classic fit. Woof – That is nice! I could get used to that real quick. Barnaby – Great point about ironing in dirt. I do iron my chinos between wears, but I am always on the lookout for dirt and stains.